The most common type of treatable dizziness is a result of crystals that are dislodged and roam in the semi-circular canals of the inner ear. This is the mechanical cause of benign positional paroxysmal vertigo (BPPV). This disorder of the inner ear causes episodes of intense dizziness on certain head movements. Other causes include infections of the inner ear, Meniere's Disease, aging of the inner ear, side effects from medication or alcohol, brain disorders such as stroke, concussion or cerebellar degeneration, cardiac problems and anxiety. 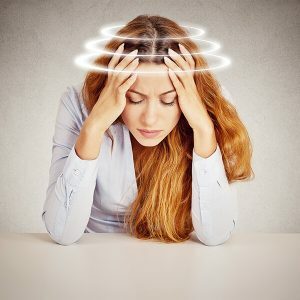 How can the dizziness be treated? What is vestibular rehabilitation? Several of our physiotherapists are specially trained to thoroughly assess and treat conditions such as BPPV and other inner ear dysfunctions which can cause dizziness. We can provide relief through non-invasive treatment techniques that effectively remove dislodged crystals from the semi-circular canals of the inner ear. Some of the more commonly used specific techniques include the Epley Maneuver, the Body Roll Maneuver, and the Modified Semont Maneuver. These techniques are extremely effective, and some studies indicate that the cure rate is as high as 97% within 3 treatments. There are also specific home exercises we can give to strengthen the vestibular system for certain dizziness conditions. This process is referred to as vestibular rehabilitation. Some specific exercises we give generally involve movement of the eyes and head, exercises designed to improve strength of the ankles and lower extremities, and balance retraining exercises. There is also a large education component to our vestibular rehabilitation programs. We give advice on activity modification in order to reduce the risk for falling and to help gradually build the patient's confidence and functional level back to normal.